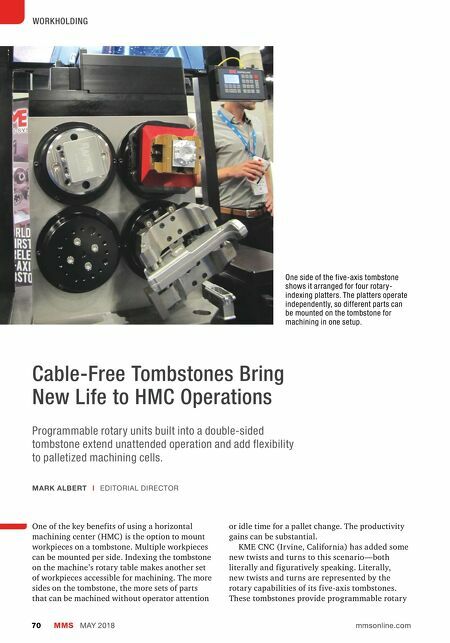 MMS MAY 2018 70 mmsonline.com WORKHOLDING Cable-Free Tombstones Bring New Life to HMC Operations Programmable rotary units built into a double-sided tombstone extend unattended operation and add flexibility to palletized machining cells. 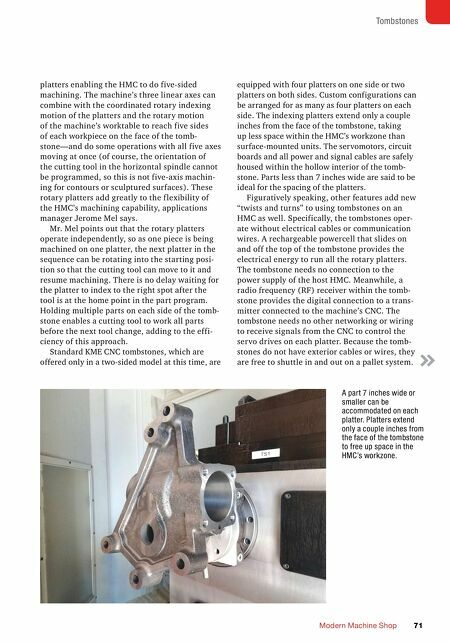 One of the key benefits of using a horizontal machining center (HMC) is the option to mount workpieces on a tombstone. Multiple workpieces can be mounted per side. Indexing the tombstone on the machine's rotary table makes another set of workpieces accessible for machining. The more sides on the tombstone, the more sets of parts that can be machined without operator attention or idle time for a pallet change. The productivity gains can be substantial. KME CNC (Ir vine, California) has added some new twists and turns to this scenario—both literally and figuratively speaking. Literally, new twists and turns are represented by the rotary capabilities of its five-axis tombstones. These tombstones provide programmable rotary MARK ALBERT | EDITORIAL DIRECTOR One side of the five-axis tombstone shows it arranged for four rotary- indexing platters. The platters operate independently, so different parts can be mounted on the tombstone for machining in one setup.